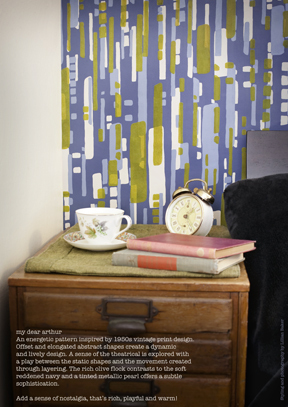 An energetic pattern inspired by 1950s vintage print design. Offset and elongated abstract shapes create a dynamic and lively design. A sense of the theatrical is explored with a play between the static shapes and the movement created through layering. The rich olive flock contrasts to the soft reddened navy and a tinted metallic pearl offers a subtle sophistication. Add a sense of nostalgia, that’s rich, playful and warm!